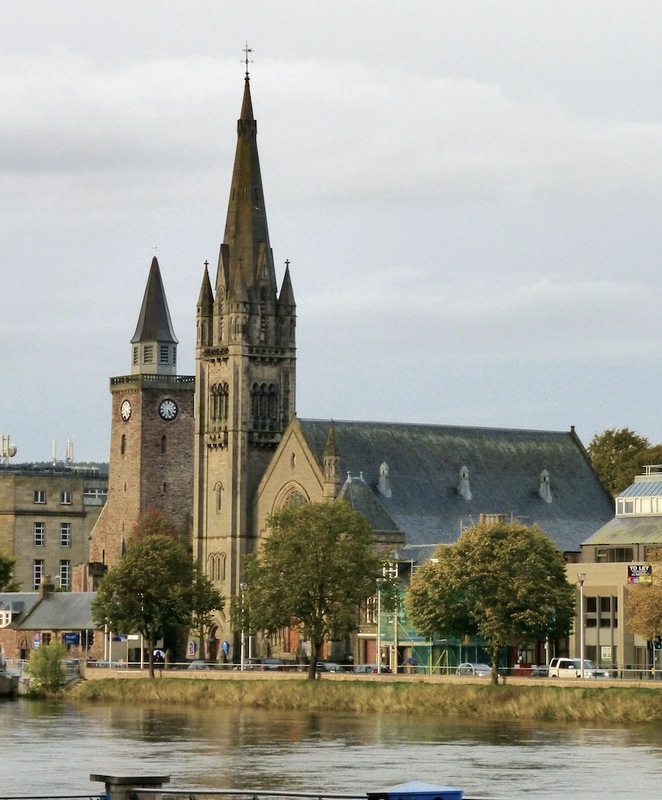 Left: The west front of the church seen from across the River Ness. Right: The south side of the church, from the churchyard. Free North, Free Church of Scotland, Inverness, by Alexander Ross (1834-1925) and Robert John Macbeth (1857-1912). c.1889-93: it was opened on 7 June 1893. 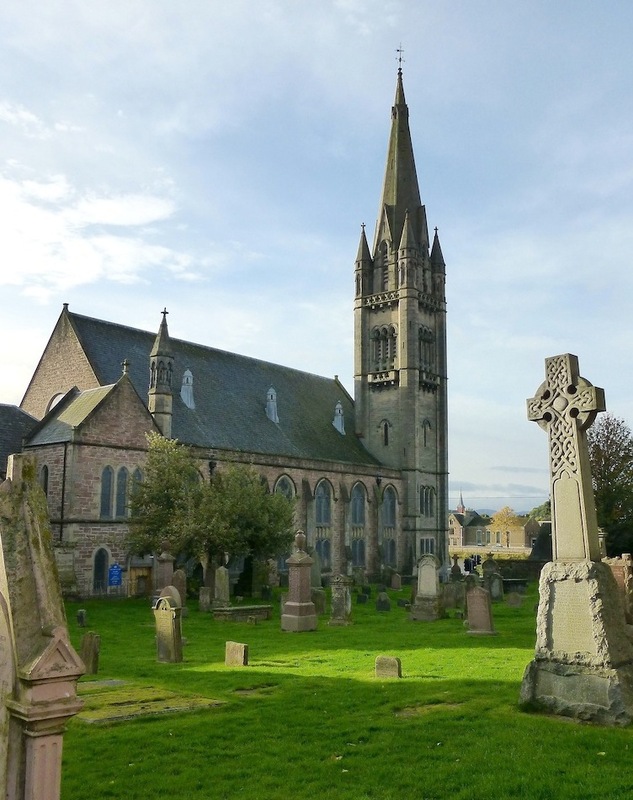 The church is described by John Gifford as: "Large and boldly detailed Dec.... its grey stone a cool contrast to the prevalent pinky sandstone of the town" (185-86). The west front, with tower, gable and porch, and stair-tower, faces Bank Street, on the River Ness. The main tower has a tall octagonal spire with lucarnes, and pinnacled buttresses (see listing text), and at 170' is the highest in the town, making a fine landmark from Ness Bridge or the opposite bank. (The lower tower next to it, with the clock faces, is that of the next church along, the Old High Church). On the side elevations, that "prevalent pinky sandstone" is again in evidence. 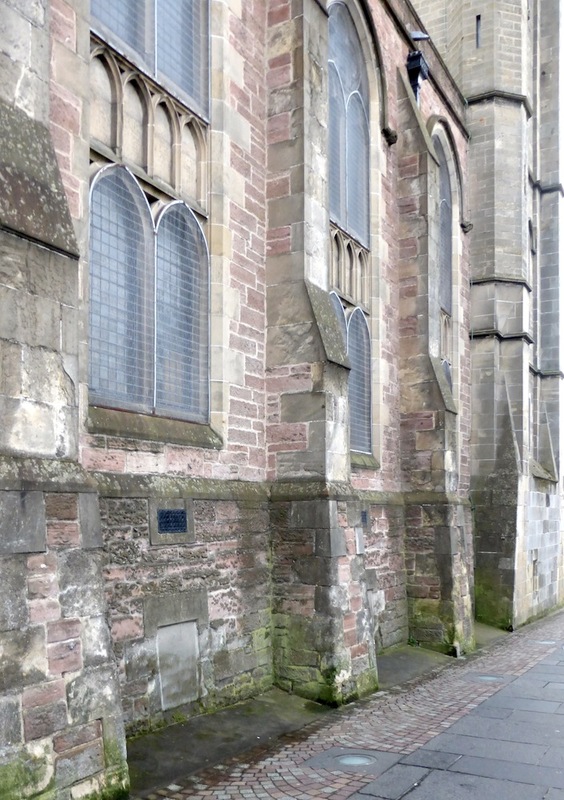 Left to right: (a) Buttressing and Gothic windows on the north side, along Church Street, looking towards the tower. (b) Round the corner at the west front, the welcoming signboard gives a view of the barrel roof. (c) To the right of the west entrance is a smaller entrance, to the stair-tower. This huge galleried church, built to accommodate a congregation of 1,300, has recently been restored, "with stencil work on the barrel ceiling" ("Free North Church"). 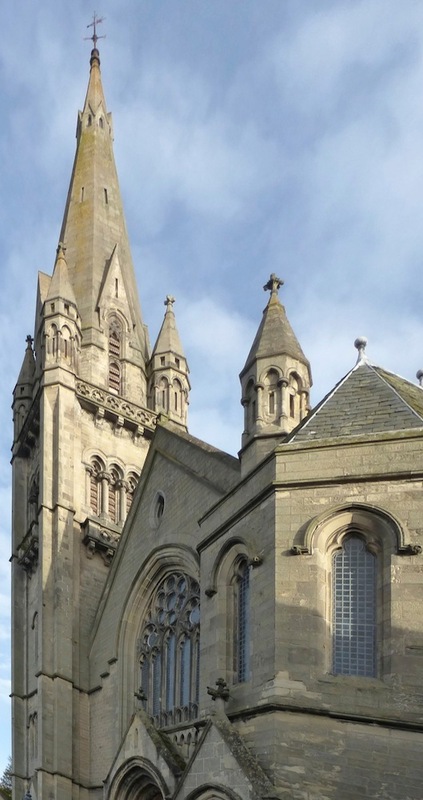 According to the Doors Open Day website, "it is typical of the Presbyterian plain style," but "surpasses most others in size and in the boldness and elegance of its detail." 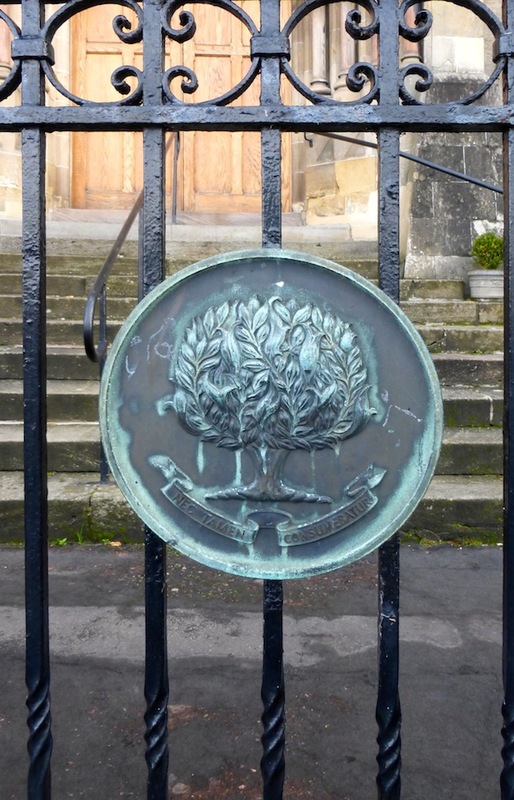 The Church of Scotland emblem on the gate. The same website helpfully explains that the "North Church congregation split from East Church (Church of Scotland) and joined the Free Church of Scotland at the 1843 Disruption." The Latin emblem on the gate is that of the Church of Scotland. It means, "Nevertheless, it was not consumed," and refers to the episode of Moses and the Burning Bush in the Book of Exodus, and, by extension, to the resilience and continuing spiritual life of the church. "Alexander Ross." DSA (Dictionary of Scottish Architects). Web. 28 December 2017. "Church Emblem." The Church of Scotland. Web. 28 December 2017. "Inverness, Bank Street, Free North, Free Church Of Scotland." Canmore (this site has many good pictures of the interior). Web. 28 December 2017. 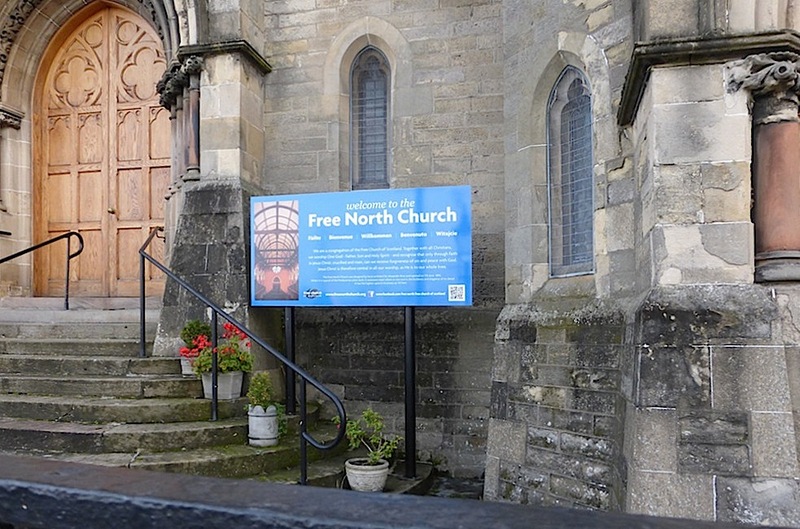 "Free North Church." Doors Open Days. Web. 28 December 2017. Gifford, John. Highland and Islands. The Buildings of Scotland. London: Penguin, 1992. "Inverness, Bank Street, Free North Church of Scotland." British Listed Buildings. Web. 28 December 2017.